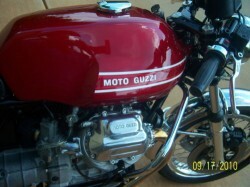 The Moto Guzzi V7 Sport was a significant model in the evolution of the sportbike. It was rare, with high-spec, hand-built components: sand-cast engine cases and high-compression pistons gave 52bhp at the rear wheel and took the bike to 120 mph and a massive front drum brake brought things to a halt. 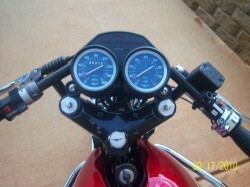 The original run of 100 [open to debate] bikes had special frames, gear driven cam timing, and polished engine internals. Racing lime green with a red frame, the Telaio Rosso bikes are rare, exotic, and very collectable. But this is not one of those machines. 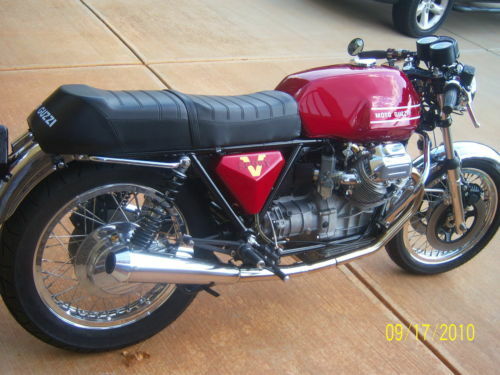 If you aren’t obsessed with originality, it’s very easy to fake a LeMans or V7 Sport: Moto Guzzi used the same, low and lean Lino Tonti-designed frame for many years. A variant was even used on the recent Jackal cruiser. 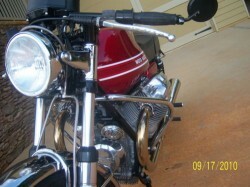 Reproduction fuel tanks, side-panels, clip-ons, shark-gill mufflers, and seats are available. Just find yourself a clean T3 donor bike, buy a few grand worth of parts, put it all together and viola! You get the look and feel of a super-rare classic, without the cost and risk of owning a piece of history: a minor crash doesn’t violate an irreplaceable landmark motorcycle. This fake V7 Sport appears very nicely done, although the bars, instruments, brakes, and pipes are not very original-looking and give the game away. 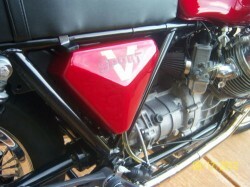 I’d have used the correct swan-neck clip-ons and Lafronconi pipes if it’d been my project… It will likely make an excellent road bike, with more torque from the 850cc motor, up from the 750 of the original V7. where was this bike advertised?